Therapy groups support people traumatised by a common issue, such as cancer, sexual abuse, or PTSD suffered in war. This therapy group is for people who were the last survivors of their world. Each of them was rescued from a parallel universe where humanity was wiped out. They’ve survived nuclear war, zombies, machine uprisings, mass suicide and more. They’ve been given sanctuary on the homeworld of the Interversal Union, and placed with a therapist who works with survivors of doomed worlds. No one has lost as much as they have. No one has suffered as they have. Their only hope is each other. Reading this was a strange and intense experience. It was also a very draining experience for me, because I’m in the very bad habit of getting really into the emotional struggles of characters; this novel is so different, and quite special. As I’ve said some time before, apocalyptic plots are not something I especially enjoy; nifty ways for my world to end are not necessarily my shade of fun, and that’s how I generally feel about novels that go about one way for the world to end. Paul R. Hardy went all out and pictured numerous ways for a world to end, and all the worlds he thought up were delightfully different, but all human. They felt human, all the bloody problems felt human and real, all the issues, all the rotten mentalities – it was thoroughly overwhelming. The plot is something very much so original, and it brings a fresh and really well built perspective on the evolution of civilizations. Of course, being a fan of psychology, the therapy part was also plenty interesting. The characters are all very layered and interesting, very different from each other. I enjoyed Asha, the therapist, and I loved her open-mindedness and constant will to help her patients. The therapy group has a really interesting dynamic, and just when you think you’ve got them all figured out, there’s a major shift and they reveal a whole new side of themselves. The life stories of the members of this group are way beyond tearjerkers, in fact I found them profoundly touching. I was really close to tears for many of them, but combined it was so shocking that you’re past tears, you’re just stunned, stupid-silent and wide-eyed. They all were dealing with the same terrifying fact: they were the only survivors of their world, the last ones of their races, of their ways of life, of their beliefs. In some cases I will shamelessly say I didn’t feel that sad the world was wiped out; when reading you’ll understand why I’m saying that. Pew was, for some reason, the one I felt the most heartbroken about. My heart went out to Kwame, and his disorientation and pain seemed almost impossible to cope with, but he was brave. Olivia is one remarkable lady, and in all honesty, my personal favorite character. She’s tough, pragmatic, abounding of attitude, really strong and a big deal stubborn. I loved her from her first grumpy comment. Iokan’s troubles are tangent on a religious take of things beyond understanding, and I found his struggle to come to terms with a harsh reality really soul-wrenching. Liss was the more spunky of them all, I guess, and perhaps her lively attitude made me feel like she could deal a bit easier with her situation. The Katie/Elsbet duo was a very interesting idea to ponder on, and their end of the world gives a lot to think about, but then again, all ends of the worlds give a lot to think about. It’s like a really nice, emotionally charged, map of many things that could easily go wrong enough to become ends of worlds. I was very into this novel, and I invested a lot of myself in the healing process of the group therapy members. Perhaps because of that, I felt the need to take pauses from reading, and it took me a lot longer then it usually does to read it. During the last quarter or so of the novel, there were a few times when I felt my interest slightly flicker, for some reason. Perhaps because by that time hopes I’d had in the beginning were proving to be unrealistic (aren’t they always?…*sigh*), and I felt a very personal disappointment in the fact all wasn’t going to be well. Of course, the amount of trauma and issues you’d be left with if you were the sole survivor of your planet are unthinkable, and perhaps not something one can really sort out in any way. But you hope it will be all right-ish, you know? 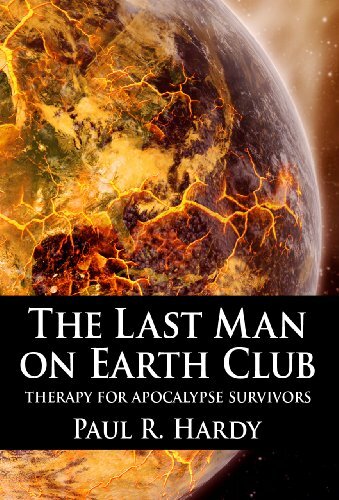 All in all, I found The Last Man on Earth Club very interesting, and I’d recommend it to sci-fi fans, especially to apocalyptic stories fans, but also to anyone who likes touching stories and well written characters.